Hi guys! 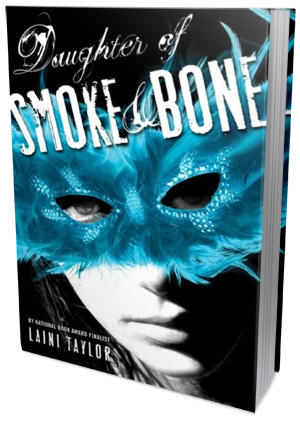 Welcome to the 2nd discussion post for our January Read-a-Long: Daughter of Smoke and Bone by Laini Taylor! Huge thank you to everyone who joined us and read the book with us in order to swoon over it together! Now, I don't know about you guys but I was completely blown-away by Laini Taylor's imagination and writing skills. The first read-a-long pick couldn't have been more perfect, honestly! I LOVED every single page of this book. It did have its slower moments, yes, but I completely didn't mind, as I was too busy enjoying Laini's beautiful writing style!! Ooooh! Can't wait to read the next book now!!! 1) Share your favorite quote or most memorable passage from the book - tell us why you like it so much! 2) Using only 5 words, describe the way you feel about this story. 3) What do you think about the relationship between Karou and Akiva? Are they starcrossed lovers destined to forever suffer or is their love powerful enough to change the world around them and bring about peace? 4) What part of the book surprised you the most? Was there anything that took you by surprise? 5) Who is your favorite supporting character and why? 6) Do you think Karou and Akiva change a lot throughout the course of the book? Would you say they're dynamic characters? 7) Trust and willingness to believe one another seem to play a big role in the story. What do you think would change if the characters trusted each other more? Or, in some cases, if they didn't put their trust in wrong places? 8) The novel closes with Kaoru and Akiva being yet again separated - what do you think will happen to them in the next book?? She had been innocent once, a little girl playing with feathers on the floor of a devil's lair. She wasn't innocent now, but she didn't know what to do about it. This was her life: magic and shame and secrets and teeth and a deep, nagging hollow at the center of herself where something was most certainly missing. She had a sadness that was so deep, but it still could turn to light in a second,and when I saw her smile I wondered what it would be like to make her smile. I thought...I thought it would be like the discovery of smiling. We are already preparing the next read-a-long for you guys!!! :) Today is the last day to vote on your pick, so head over to this post and cast your vote!!!! And remember, it's never to late to sign up for 2014 TBR Pile Reading Challenge and/or join our monthly read-a-longs, so spread the word and invite your friends to join the fun! Everyone who takes part in our January TBR Pile Read-a-long is going to get 10 extra entries into our January Wrap-up giveaway for the TBR Pile Reading Challenge! The Wrap up is up on Bookish and you can find it HERE!!! 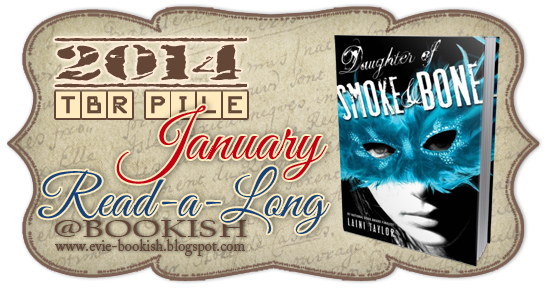 And don't forget to stop by tomorrow for the wrap-up post where you'll be able to link up your reviews / thoughts about Daughter of Smoke & Bone!! !